Metso is introducing its state-of-the-art solutions for the metal recycling industry at ISRI 2019, the industry's leading tradeshow in Los Angeles, US, April 8-11. Metso's experts at booth C1 are ready to show how to make scrap processing simpler, smarter and more efficient. "All our recycling solutions are well-known for their high efficiency, durability, usability and low energy consumption. The recycling solutions we're introducing at ISRI are helping our customers to achieve their business' targets, whether that's related to increased and more efficient production, ease-of-maintenance, safety measures or other industry relevant challenges," says Mark Haire, Vice President, Metal Recycling Americas. Metso's N-Series line of robust shears and balers are suitable especially for smaller and mid-market operators. Metso's N-Series(TM) has become the popular choice amongst small to midsize market operators and niche industries around the globe. The N-Series Modular (NMS) Shear / Baler / Logger (SBL), is the most recent addition to the popular product line, meeting the growing market demand for site-to-site and on-site mobility. ISRI visitors will have an opportunity to acquaint themselves with Metso's NMS 612-9 ML60 mobile SBL. The exclusive solution provides scrap facilities with a robust and reliable shear available in their choice of stationary, transportable, mobile or track-mounted styles to best meet their facility requirements. The current NMS Series shears have a 660 to 700-ton shearing force range. 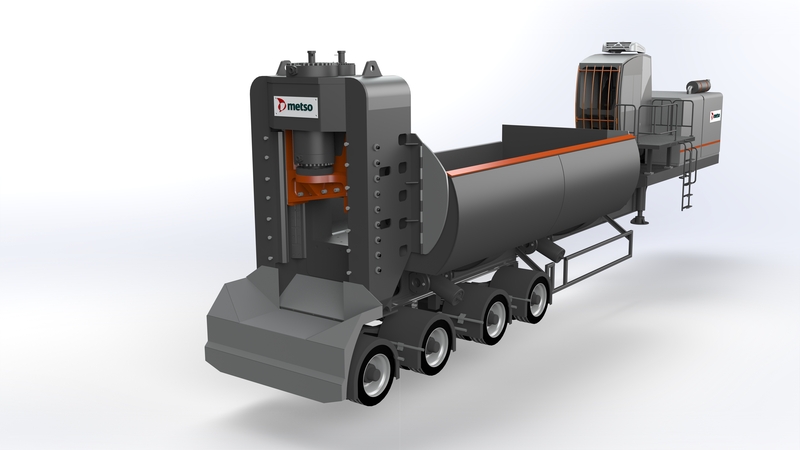 Through its Texas ShredderTM and LindemannTM product lines, Metso offers a full range of pre-shredders, automobile shredders, shears, balers, and briquetters, along with complete capabilities for developing custom solutions for our customers' ferrous and non-ferrous scrap processing needs. Lindemann EtaRip(TM) is a heavy-duty pre-shredder providing greater shredder efficiencies by pre-shredding bales and ELV's. This results in better sorting and fewer unshreddables into the main shredder, significantly reducing the risk of explosions and maximizing production output. The N-Series product range offers robust performance for smaller operators and for niche industries. The portfolio includes the NIS Inclined Shear, NCS Clamshell Shear/Baler/Logger, NMS Mobile Shear/Baler/Logger, NTB Triple Ram Baler, NLB Lid Baler, and NBS Box Shear. The NIS Inclined Shear, for example, has proven itself as an excellent solution for shearing reclaimed rebar from C&D (construction and demolition) sites, which is historically a very challenging material to process. Texas Shredder PS series automotive shredder for heavy duty processes with intelligent design. Lindemann PowerCut(TM) is a sophisticated shear technology for medium production volumes with minimum energy consumption and costs. Lindemann EtaPress(TM) easy to use balers with minimal demand on maintenance and long service life. For more information on Metso's featured solutions at the event, please visit our website. In total, over 120 Metso shredders are currently in operation in North America alone, which represents about 40% of the total operating capacity in the market. Additionally, through the Lindemann and Metso N-Series brands, there are over 40 shear and baler installations currently in North America. This is exemplified in Metso being sequentially named as AMM's Scrap Equipment Provider of the Year for 2017 and 2018.